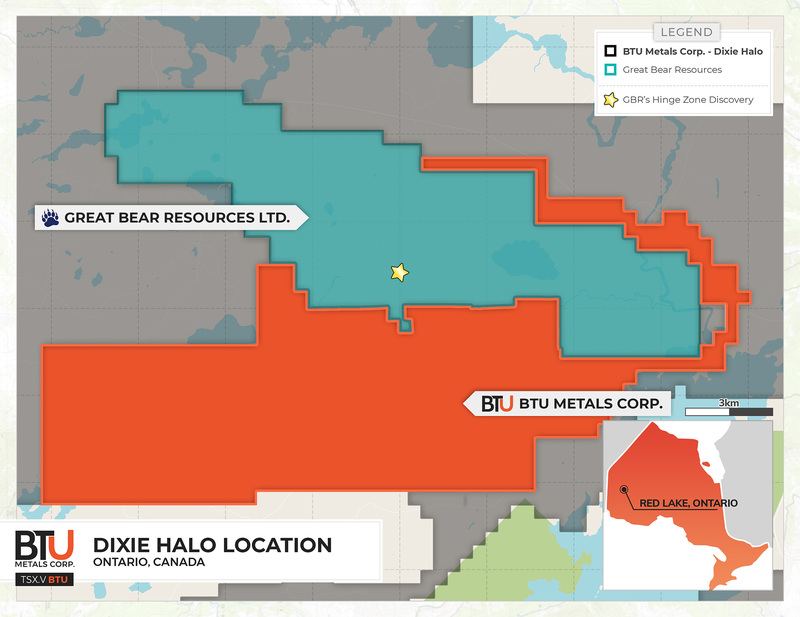 The Dixie Halo gold project consists of four properties totaling approximately 12,963 hectares surrounding Great Bear Resources Ltd.’s Dixie gold project. Great Bear reported a high-grade discovery in drill core assaying 16.35 meters of 26.91 g/t gold and 7 meters of 44.47 g/t gold in two holes on the "Hinge Zone" at Great Bear's Dixie Project (see PR dated August 22, 2018). Privately-run exploration at Dixie Halo South included trenching, power and manual stripping, prospecting, and limited sampling. Gold values obtained from surface sampling have returned values up to 4.61 g/t gold in association with 283 g/t silver and 11.5 per cent copper from a limited 2013 grab sampling program. A HELITEM EM/MAG survey was conducted by the vendor in 2012. Processing this data resulted in 30 gold and volcanogenic massive sulphide targets being outlined, six of which are currently being focused on. The first detailed maps of the property were created with the assistance of Tony Pryslak, former resident geologist with 50 years of experience in the Red Lake area. Initial findings of an ongoing, in-depth assessment of geophysical data include the existence of multiple zones of major D2 fold disruption. 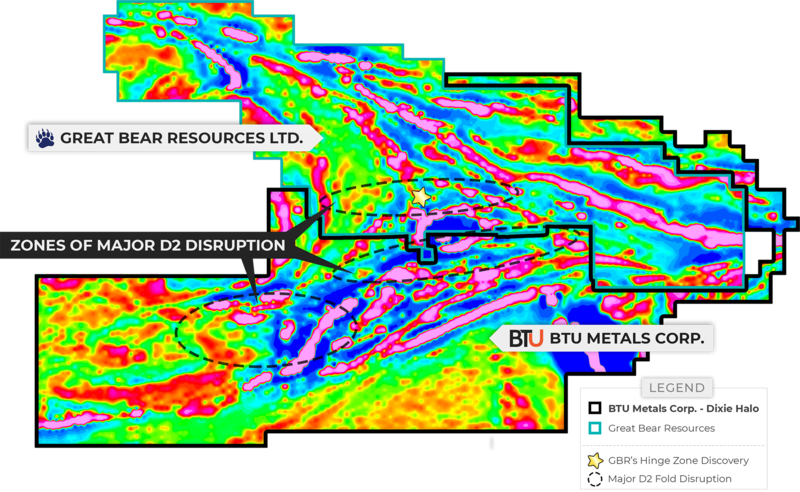 Well known geophysicist Mr. Alan King of Sudbury, Ontario has helped identify D2 folds within the Dixie Halo boundaries that are of particular interest to BTU as these have been successful indicators for neighboring Great Bear Resources Ltd. (GBR-TSX:V) at its Dixie Project. Additionally, the Red Lake-Campbell complex (Red Lake gold mine) also occurs proximal to a regional D2 fold where shear zones developed and acted as primary hydrothermal fluid conduits. 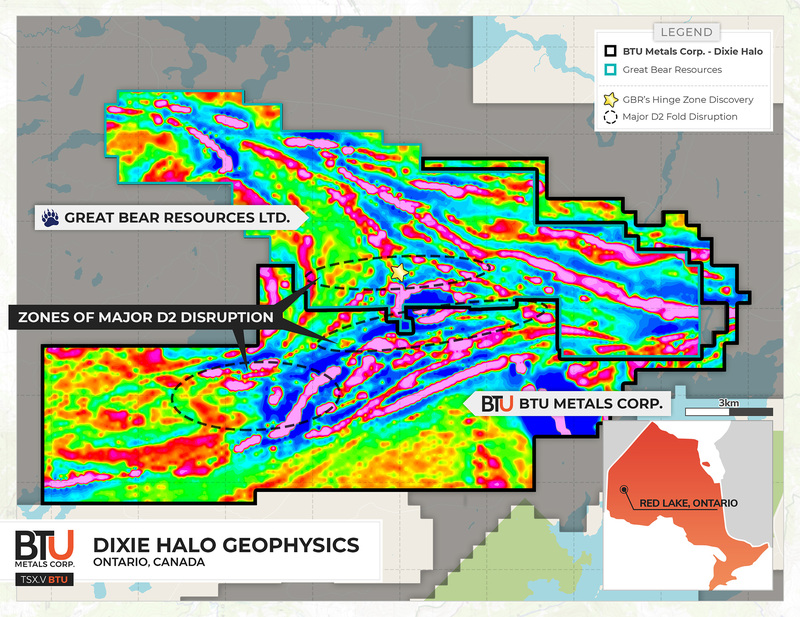 Additionally the "Hinge Offset" thesis, initially developed by BTU Metals advisor Dr. Tony Pryslak, helped shape the current exploration targets on the Dixie Halo property. This thesis was reinforced with supporting evidence from the Fugro Helitem Survey flown by the vendor of one of the Dixie Halo claim blocks.